OPPO introduced first Prisms shaped Mirror 5 Smartphone which is designed with individual cut-glass sections and different reflective tendencies. OPPO Mirror 5 seems like a leading character of a complicated design in a good way, Mirror 5 opens new doors to new possibilities. 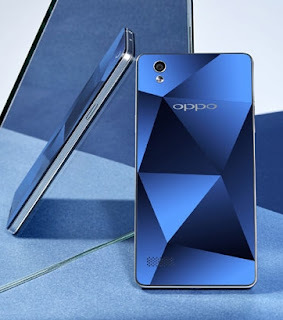 OPPO Mirror 5 comes with 2 GB RAM Dual SIM 3G 4G LTE technologies Multi-function Photo Shoot Features For Breathtaking Images with 8 MP rear camera. For Detail Spec. 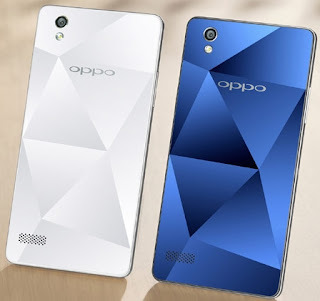 Android OS, version 5.1 (Lollipop), 1.2 GHz Quad-Core Cortex-A53, Qualcomm MSM8916 Snapdragon 410 GPU: Adreno 306, 16 GB Built-in, 2 GB RAM, MicroSD Support (up to 128 GB), 5.0 inches display size with 540 x 960 pixels, Dual Sim+Nano Sim, 3G, 4G LTE, GPS + A-GPS support. 8 Mega-Pixel Rear camera with 3264 x 2448 pixels, auto-focus, LED flash, Geo-tagging, touch focus, face detection, HDR, panorama, Video 1080 pixel @30fps and 5 Mega-Pixel Front camera.